For Chey Tae-won, chairman of SK Group, it all started with one question. 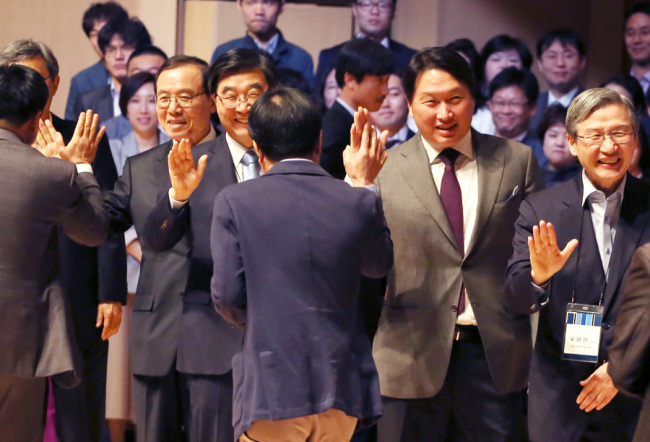 For years, the second-generation chaebol scion was seeking a way to inherit his father’s legacy of nurturing scientists and scholars for the nation’s future. Though SK was making social donations and running corporate responsibility programs under his lead, Chey wasn’t sure whether those outreach efforts -- worth billions of dollars a year -- were making any progress in society, where problems of unemployment and the income gap remained unchanged. Then in 2009, a forum he attended introduced him to a new way of thinking. Chey, the head of the nation’s second-largest conglomerate, is seen as an unusual figure in the corporate world who studies day and night to get better insights into his mission. Some critics remain skeptical of the tycoon’s unusual drive for nurturing social enterprises, questioning his real motives. But insiders at SK say the chairman is really serious about his work. “He reads a lot about social enterprises and is always seeking for better ideas to build a sustainable ecosystem for social enterprises,” one SK official said. Then Chey came up with a new concept. The social program credit, which he introduced in his book three years ago, is an incentive system for social enterprises. It offers financial assistance to social enterprises participating in the SK program by measuring how much of a contribution they have made to society. Incentives are given for three years, quantifying how much they did something “good” for society each year. What makes the system unique is that it measures not the profit the companies made, but the value they created in the course of their operations. Chey believes that offering incentives by measuring the value of contributions the companies made to society will resolve the dilemma they face as social enterprises. “I believe that the incentive system can solve the biggest problem faced by social enterprises, which are tasked to create their social value while making a profit at the same time,” he wrote. From a company recycling toner cartridges for printers to reduce waste to a wall painting company that turns abandoned urban spaces into studios for public arts, SK supported more than 100 companies last year. The value of social contributions the companies made also surged from 10.3 billion won in 2015 to 20.1 billion won a year later. Financial resources are all coming from Happy Narae, a social enterprise purchase outsourcing company set up by SK and its affiliates, officials said. As SK expands its presence thanks to its thriving chip, telecom and energy businesses in and out of the country, the unusual mission of the chairman is expected to go forward. And he has been raising his voice recently, urging corporate members that the role of conglomerates have to change. “How much social value is created by a business determines the reason for its existence,” he said during an in-house CEO seminar last week.